Prof. Rajan with his combined space and robotics experience. Enter the Norwegians. Funding that’s hard to fathom, for Rajan is listed as an NTNU employee, a NASA employee and some, and experience storing and processing vast volumes of an associate of the U. of Porto. 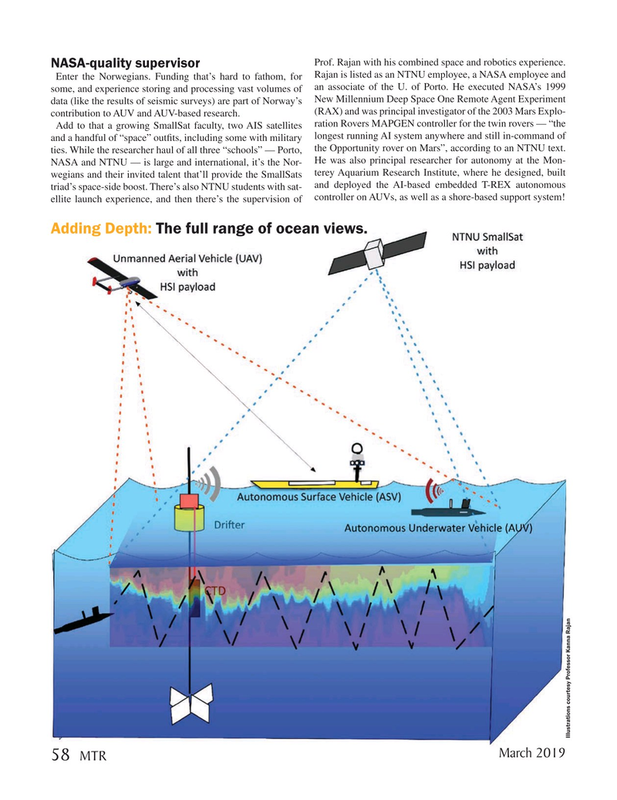 He executed NASA’s 1999 data (like the results of seismic surveys) are part of Norway’s New Millennium Deep Space One Remote Agent Experiment (RAX) and was principal investigator of the 2003 Mars Explo- contribution to AUV and AUV-based research. Add to that a growing SmallSat faculty, two AIS satellites ration Rovers MAPGEN controller for the twin rovers — “the and a handful of “space” out? ts, including some with military longest running AI system anywhere and still in-command of ties. While the researcher haul of all three “schools” — Porto, the Opportunity rover on Mars”, according to an NTNU text. NASA and NTNU — is large and international, it’s the Nor- wegians and their invited talent that’ll provide the SmallSats terey Aquarium Research Institute, where he designed, built and deployed the AI-based embedded T-REX autonomous triad’s space-side boost. There’s also NTNU students with sat- ellite launch experience, and then there’s the supervision of controller on AUVs, as well as a shore-based support system! Adding Depth: The full range of ocean views.